A great option for those wanting to do a thrilling airboat ride and do not have their own transport in Orlando. With the Airboat Rides with Transfers ticket, you will be picked-up from your hotel and transported to a thrilling 30-minute airboat ride in the beautiful Central Florida Everglades. Your airboat ride starts with a leisurely cruise through the wetlands in search of local wildlife including alligators, turtles and exotic birds in their natural habitat. Then your captain will crank up the speed and you will zip across the water at speeds of up to 45 miles per hour through walls of tall grass. 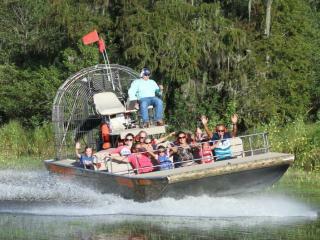 The Airboat Ride with Transfers operates on Mondays, Saturdays and Wednesdays at 10.15am. Hotel pick-ups take place from 7.30am.